Homechecks are a vital part of the adoption process. Many years ago, we used to do homechecks with the potential adoptee in tow. On some occasions, everything would go beautifully, and on others, the homecheck can just seem to lurch from one disaster to another. We had the most lovely Poodle some to us called Monty. 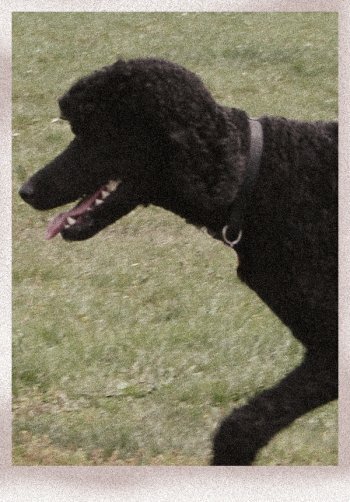 He was a big, black Standard Poodle, but had one vice – he really didn’t like cats. However, a lovely couple who’d adopted from us before were besotted by Poodles, and really wanted Monty to meet them at home. They did have cats, but they assured us that the cats were more than savvy; one of their other poodles hated cats too. Monty met their old poodle outside, and got on famously, and so we all retired to the house where Monty was allowed to have a good explore of the spacious open-plan living room and kitchen.